Sospel is a small town situated about 15km inland from the coastal resort of Menton and close to the French border with Italy. 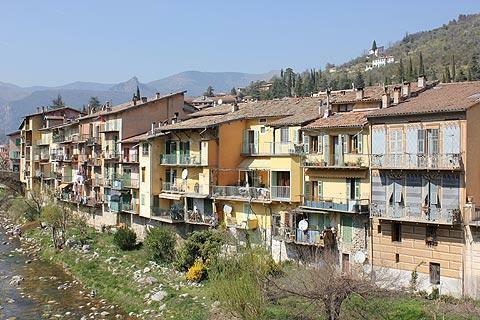 Standing at the entrance to the Roya Valley, the town is within the extensive Mercantour National Parc, with the busy Riviera resorts to the south and the mountains and remote perched villages of the Alpes-Maritimes to the north. 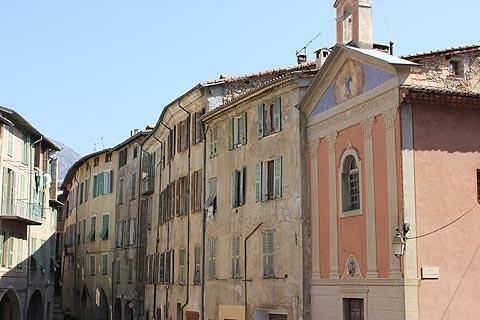 An ancient town, Sospel became prosperous in the 13th century when an important salt trading route between Nice and Turin passed through the town and those using the route paid tolls to use the bridge across the Bévéra river. 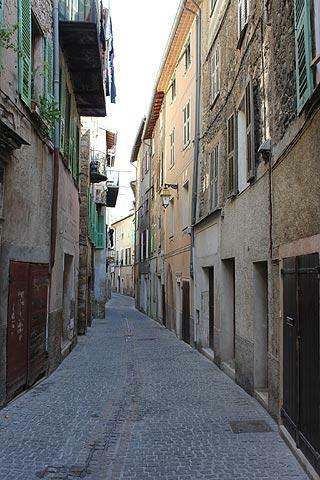 In places this medieval town feels almost Italian in character. 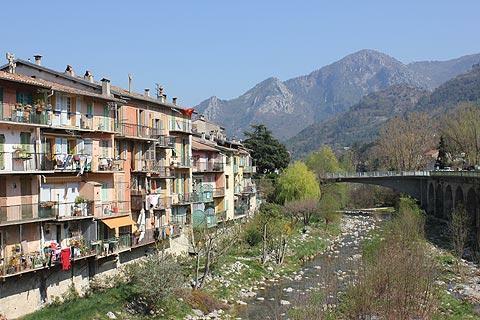 There is much to enjoy as you explore Sospel, both in the old town and along the river front. Start your visit at the fortified stone bridge across the river that joins the two halves of the town. The tower in the centre of the fortified bridge was originally the toll gate for the mules using the trade route. A bridge has stood here since at least the 13th century, although it is likely the original version was built of wood. In 1522 the wooden bridge was replaced by a stone version, much as we see it today. Note: with the exception of the lower part of the tower much of the bridge is actually a 20th century reconstruction, based on the original design and using the same stone, following extensive damage during the German retreat from the area in October 1944 towards the end of the Second World War. Over the course of the centuries the tower has been used for toll collection, as a habitation, and also by various businesses. From the bridge there is a nice view of the houses along the riverbanks - but beware of trickery! Several of the houses have been painted using very realistic trompe l'oeil effects including false windows and doors, a technique that you will also see used elsewhere in Sospel and dating from the 19th century. 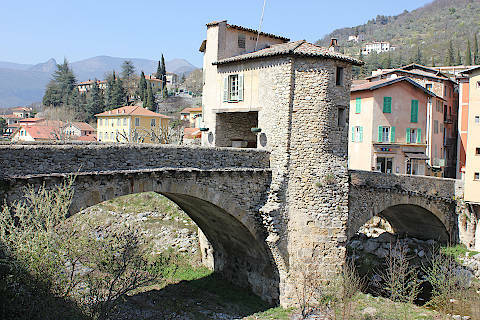 The old town in Sospel falls on both sides of the bridge, although the area around the cathedral is the most extensive. The smaller historical area on the left bank of the Bévéra river follows the Rue de la Republique and the small square at the end of the bridge. Now a very quiet narrow street it is hard to imagine that the Rue de la Republique was once a bustling centre for the mule trains that carried salt through the town. A sign in the town explains that the houses along this street originally had open arcades at ground level for trading - these have now been filled in but on several of the houses you can still see the traces of the original arches that opened into the arcades. The Rue de la Republique leads you to one of the highlights in Sospel: the Chapel des Penitents Blancs, also known as the Chapel Sainte Croix, and built on the site of an earlier church. 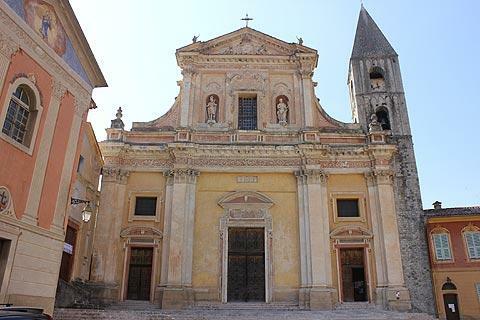 This 16th century chapel is unassuming on the outside and has a belltower added in the 19th century, but the interior contains numerous paintings, frescoes and other items of artistic interest. Crossing back across the bridge you can explore the historical area around the cathedral. The streets of the old town contain numerous attractive medieval houses, many with decorative painted facades. These streets open into small squares, some with traditional stone fountains of interest, such as the one in Place Saint-Nicolas (the most attractive of the squares) and another on Rue de la Republique. 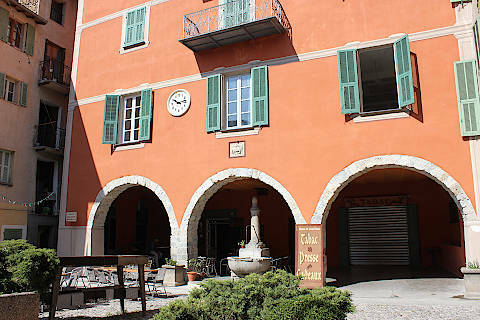 In Place Garibaldi you can also see a traditional washhouse. The baroque style Cathedral of Saint Michel was built between 1641 and 1762 and faces across an attractive square with arcaded and pastel painted houses and two smaller baroque chapels. As with the cathedral at Tende to the north, the building seems out of all proportion to the size of the town - it was built by the town residents at the conclusion of an outbreak of the Black Death to give thanks for their survival. Note that the roman style belltower to the right of the facade dates from the 13th century and the previous church that stood here. 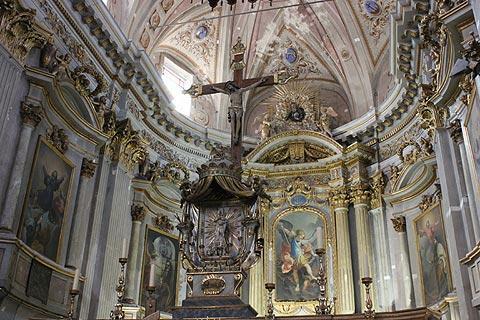 Inside it is the decoration around the altar and the frescoes of the ceiling that is of most interest inside Sospel Cathedral. At one time Sospel was a fortified city and you can still see some castle ruins at Sospel, although little now remains except a 14th century tower. Of more recent origin, just outside the town you can visit a museum that commemorates the Maginot Line, the defences constructed along the eastern border of France to prevent invasion during World War II. The museum is at Fort Saint Roch, constructed in the 1930's as part of these fortifications. Opportunities for exploring scenic countryside and traditional villages are almost unlimited in the Mercantour National Parc, with the the Valley des Merveilles a popular highlight in the region and the villages of Saorge and La Brigue among our personal favourites. See also Roya valley guide for more places to visit nearby.